After Hallam Ashley's death, the majority of his photographs were given to the National Monuments Record (now the English Heritage Archive). His daughters retained only a small amount of material, of which the mill photographs were donated to the SPAB Mills Section by his daughter in 1998. In February 2004 the archival material in the possession of the Mills Section was transferred to The Mills Archive. His daughter was contacted at the time and assigned the copyright to The Mills Archive. 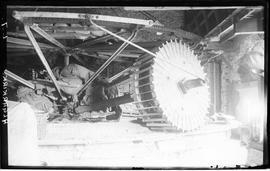 Photographs and negatives, some mounted on glass, depicting windmills and watermills. These are mainly in East Anglia. Interior and exterior views are shown. Parts of the collection have been given individual catalogue entries. The remainder is listed in the attached PDF. The majority of Hallam Ashley's photographs are held by the English Heritage Archive, in the Hallam Ashley collection (Reference No. HXA01). Hallam Ashley photographs are also held by the Norwich Castle Museum.